At the AGM held on Wednesday 25th. 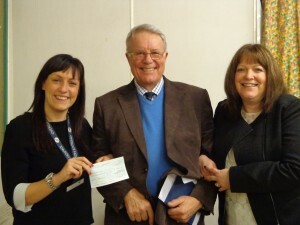 February 2015, John Hone presented a cheque for £9,000 to Laura Golding, Fundraising and Retail Manager, and Angela Walton, Clinical Services Director of Overgate Hospice. Since 1991, the Choir has raised £262,126 for Overgate Hospice. Please give Joyce Sharp, our Treasurer, your annual subscription which we contribute to cover the cost of our weekly rehearsals. The subscription for 2015 is £75 with a reduction of £5 if you pay Joyce by 25 March 2015.